27 Dec 1979 - Brennan C. Gibson was born in Van Nuys, CA. The youngest of six. 2003 - Graduated from Oregon State University in Cornvallis with a bachelor of science in art with emphasis in gaphic design. Member of Theta Chi fraternity. Brennan spent much of his free time designing graphics and houses on his computer or sketching in one of a dozen sketch pads. He had a great sense of humor and a strong sense of doing his best in all his commitments. He graduated One Station Unit Training as an 11B Infantryman from B Company, 2nd Battalion, 58th Infantry at Fort Benning, Georgia. Upon completion of One Station Unit Training, he was assigned to D Company, Special Troops Unit, Support Battalion, at Fort Bragg, North Carolina. 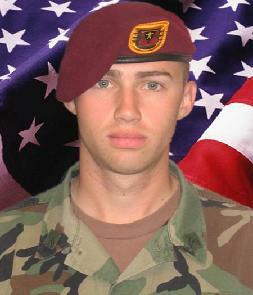 00 Oct 2006 - SGT Gibson deployed in support of Operation Iraqi Freedom. While deployed with the 3-509th Infantry (Airborne) he was attached to Task Force 1-26 where he participated in numerous combat operations and patrols in Eastern Baghdad in support of Operation Together Forward II. SGT Gibson was an integral part of the team, dedicated to mission accomplishment, and displayed unwavering courage and commitment. 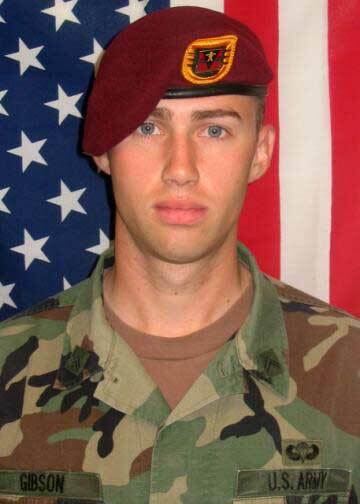 10 Dec 2006 - SGT Brennan C. Gibson was Killed in Action when an improvised explosive device detonated next to his HUMVEE in Baghdad, Iraq. Also killed was SPC Pillip C. Ford and PFC Shawn M. Murphy. Surviving and left to honor his life are: His wife, Corinna and son, Kaden of Anchorage, Alaska; parents Kirk Elliott of Elkridge, MD and Linda and John Gibson of Springfield; five older brothers and sisters, Sean, Travis, Stacy, Stephanie and John, Jr.
Army Sgt. Brennan C. Gibson, 26, of Tualatin, was killed in action in Baghdad, Iraq on Sunday. Gibson died from injuries suffered when an improvised explosive device detonated near his vehicle, according to the U.S. Department of Defense. Gibson, along with two other soldiers who died from the explosion, was assigned to the 3rd Battalion, 509th Infantry (Airborne), 4th Brigade Combat Team, 25th Infantry Division in Fort Richardson, Alaska.